We’d love your help. Let us know what’s wrong with this preview of You Are Here by Jennifer E. Smith. I have just finished this book for my book report and can't seem to pick out the theme, does anyone know mind telling me what it is? Marketing can be a wonderful thing. Why you ask? Well I wouldn't have bumped up this book up on my to-read list if I hadn't seen the new cover. Shameful, I know! Then I made the connection this was the author coming out with The Statistical Probability of Love at First Sight and so of course I had to proceed with the next logical step: read the book. Emma Healy is the youngest member of her genius family. Her parents are professors for the local college and she has three older siblings who are ju Marketing can be a wonderful thing. Why you ask? Well I wouldn't have bumped up this book up on my to-read list if I hadn't seen the new cover. Shameful, I know! Then I made the connection this was the author coming out with The Statistical Probability of Love at First Sight and so of course I had to proceed with the next logical step: read the book. Emma Healy is the youngest member of her genius family. Her parents are professors for the local college and she has three older siblings who are just as or even more successful. She has always felt a bit out of place, the only "normal" or "average" person in the bunch. The summer seems to shaping up to be like any other, but she makes a discovery that will spur a need to find something, and the road trip is born. Her nerdy next door neighbor, Peter Finnegan, gets entangled on this trip. Both of them are trying to find something on this trip, and in the end they may end up with more than they thought they would. First word I think of when I see this book is untypical. By the synopsis you think that Emma and Peter will have this spark of attraction right away and it will be filled with fun-filled antics. Nope, that is not the case. They have awkward silences, and they aren't that honest with each other at first. It *gasps* takes time for them to actually get to know each other? I know new concept right? They do have some fun stuff happen but mostly it's what a road trip would be like; kind of dull sometimes but having it's certain highlights. There is ridiculous stops, gas station food, weird sleeping arrangements, and the open road. They also have a shaggy dog as a companion, which needless to say makes things more interesting. They both take turns narrating but in third person so we get to see certain event through each of their point of views. I fell hard for Peter because he is a person who is just so himself and though he may feel uncomfortable about it at times, he doesn't apologize about it. Now Emma on the other hand took some time to warm up to. She came off as insensitive and too self-involved at times. In time she comes around though. But she (for me at least) was what brought the book down a tad bit. One of things I always appreciate reading about is family dynamics and even though this is mostly about the road trip, as the reader you get to see the intricacy and simplicity of family relationships. It's a hard thing to do but this author managed to do it. I was on a huge reading marathon this week and all the books that I have read so far are books that I love and most of them are rated 5 stars. Since I just finished the Archived series, I was having trouble picking up another book. After reading the Dork Diaries, I still couldn't stop thinking about the Archived series, it was crazy! So I decided to pick this book up because I thought it would help me recover. But instead, it just made me really bored. I was so en I was on a huge reading marathon this week and all the books that I have read so far are books that I love and most of them are rated 5 stars. Since I just finished the Archived series, I was having trouble picking up another book. After reading the Dork Diaries, I still couldn't stop thinking about the Archived series, it was crazy! So I decided to pick this book up because I thought it would help me recover. But instead, it just made me really bored. I was so energetic when I started the book but while I was in the middle of the book, I was so bored, I wanted to fall asleep. It wasn't something that I enjoyed, and this might be because of the fact that I read so many contemporary road trip books. Either way, I did not enjoy this book at all and I wished I did. This book is about a girl named Emma who discovers a birth certificate of her twin brother whom she never met before. He died two days after he was born and she never knew she had a twin brother. This made her think about going on a roadtrip to visit his grave. Along the way, Peter, her neighbor is dragged on the trip. This book was different from the other road trip novels but it was so descriptive. The writing was something that I wasn't a huge fan of. Sometimes, I felt like the writing would be perfect and most of the time it was really boring and I felt like I couldn't go on. But for some reason, I felt like the story would get better. BUT NOOOOO, it didn't. The story got worse. I was so upset because the characters made such dumb decisions. WHY WOULD YOU THROW YOUR PHONE AWAY? ARE YOU KIDDING ME EMMA? Emma was really annoying and Peter was so quiet and Emma was taking advantage of Peter. When Peter tried to kiss Emma and she avoided him, it was so embarrassing, I felt so embarrassed for Peter. I didn't feel any connection for any of the characters other then the fact that they feel alone. But both of the characters were just so annoying and couldn't make the right decisions that it was driving me insane. The conclusion was so cliche and I was sitting there and I was like, that's it? Are you kidding me, this is the ending? This is what I was waiting for, and I thought it would get better. And I went bonkers. I just couldn't get over the fact that I wasted my time on a really boring, cliche book. 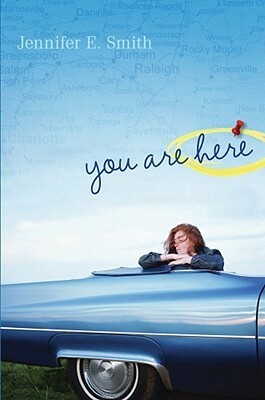 After Emma discovers a birth certificate for a twin brother she never knew she had, she sets out on a road trip with her neighbor, Peter, heading for North Carolina where her brother was born (and supposedly buried a few days later), hoping to find answers about this unknown part of her life. Along the way, the two of them get to know each other, and I'm pretty sure a romance develops between them, although I stopped reading before that happened. There was nothing particularly wrong with this boo After Emma discovers a birth certificate for a twin brother she never knew she had, she sets out on a road trip with her neighbor, Peter, heading for North Carolina where her brother was born (and supposedly buried a few days later), hoping to find answers about this unknown part of her life. Along the way, the two of them get to know each other, and I'm pretty sure a romance develops between them, although I stopped reading before that happened. A fast and light read. SUPER CUTE and fluffy. Have I mentioned I absolutely love roadtrip books? Yeah this is one of my favs! But I was really bored reading this story. Maybe it's because I don't like reading in the 3rd person point of view. But this story was not fast paced and wasn't attention grabbing enough. I did enjoy the friendship aspect but their love relationship didn't really grow even towards the end and that was such a downer for me. It has been a while since I full on hated a book this much, but this book infuriated me like crazy and I barely finished it .. the story is about coping with grieve and getting to know yourself better but what I read was all about how bitchy this girl Emma is for dragging poor Peter in her pointless adventure and he has to put up with her bad temper and her lack of trying to be nice despite the fact that she actually asked him to join her !! WTF Emma ? are you for real ? I really hated her so mu It has been a while since I full on hated a book this much, but this book infuriated me like crazy and I barely finished it .. the story is about coping with grieve and getting to know yourself better but what I read was all about how bitchy this girl Emma is for dragging poor Peter in her pointless adventure and he has to put up with her bad temper and her lack of trying to be nice despite the fact that she actually asked him to join her !! Yep. This book was a snoozefest. And I didn't realize it soon enough to quit. Emma and Peter are two boring teenagers. Emma is excessively needy, whiny, and demanding. Peter does whatever Emma says. They take a really boring trip all the way down the east coast without their parents' permission, and everything I didn't care about was resolved really easily. I was overjoyed when it was over. My heart is so toasty now! That was just such a sweet and heartwarming story. This was a beautiful road trip story of two teens who felt lost, and sort of found themselves and each other. This is a quite book. It's not filled with action and adventure, but it is filled with self discovery and some really lovely moments, where the characters mourn their losses. I smiled and shed some tears, but most of all, I felt my heart fill with joy. I was surprised to find that this book was written in third person (I've gotten so used to the narrative being in first person in YA books) but I think it worked well with this story. Especially when it came to the different voices of Emma and Peter. Both Emma and Peter are loners and both struggle with their role in family life, though for different reasons. Emma was raised in a family of odd geniuses and, being pretty average herself, has never felt like she belongs. Both Emma and Peter are loners and both struggle with their role in family life, though for different reasons. Emma was raised in a family of odd geniuses and, being pretty average herself, has never felt like she belongs. Peter, meanwhile, has a father who doesn't understand him, who wants Peter to stay at home when his son wants to see the world and who never brings up the topic of Peter's dead mother, even though – never having known her himself – Peter craves this information. When Emma discovers a birth and death certificate of her twin brother, she steals her older brother's car, setting out to find her twin's gravestone, hoping it will solve the puzzle of her life. But when the car breaks down, she enlists the help of Peter (her neighbour) to continue the journey. Peter gladly joins, having just - after an argument - stolen his father's car. Emma's call gives him a destination to head to and the two make the trip together. This was a sweet, peaceful book about finding yourself and making peace with the past – as most road trip books are! Peter was definitely my favourite character, as his awkwardness was really quite adorable! Emma I still remain unsure about, though toward the end she did warm to me a bit more. Yes she didn't fit into her family, but they did care about her and at times I felt she came off as ungrateful to them – and to Peter. She did pull it together in the end though. I would have liked to have seen more destinations in the book, I think. After Amy And Roger's Epic Detour (where they see lots of sights), I found this book was lacking in that area. They visited Emma's sisters, a battlefield that meant a lot to Peter and that was about it. I felt the book could have been longer, perhaps different places could have been added. I was also very unsure about the time period this was set over. I was sure that they had only stopped for two nights but at the end Emma mentioned that they had been traveling a week, which really confused me! This sounded way improbable and silly, and it is. And that's okay. But it didn't do as much for me as some of Smith's later books. For whatever reason, this ended up being mostly dull and not worth my time. Smith's other books, barring Hello, Goodbye, and Everything in Between, are much more enjoyable. You Are Here was just as I expected -- a great contemporary YA read. I've read several of Jennifer E. Smith's novels and have yet to be disappointed with any of them. I think I can say now that she is a definite favorite YA author of mine. I loved this book and cannot wait to read even more of her novels. The characters in this story were great and I loved the dog (felt so bad when it got injured!). Wow. I never expected to actually like this. This is one of those coming of age stories that is damnably relatable. During our teenage years, we try to do silly or rebellious things - whether the sense of curiosity is too high or you just want an escape of the mundane everyday life. In this story, our protagonists embark on a roadtrip without telling their parents. Along the way, they got to know each other better as even if they were neighbors for 8 years, their relationship has never reached a Wow. I never expected to actually like this. This is one of those coming of age stories that is damnably relatable. During our teenage years, we try to do silly or rebellious things - whether the sense of curiosity is too high or you just want an escape of the mundane everyday life. In this story, our protagonists embark on a roadtrip without telling their parents. Along the way, they got to know each other better as even if they were neighbors for 8 years, their relationship has never reached anything more than being acquaintances. Despite their misunderstandings and mutual disagreements, the two have grown mature individually, which made me sigh in relief. I'm really glad to see the character development. Well obviously it was a good easy read because I finished it in about 4 hours. 8-) Good story though, and not really all that juvenile for a post that is considered YA. Has some good things to say and while I only picked it up for a challenge I am glad I read it. This book had a lot of potential to be a 5 stars for me but it was boring... the last half of the book was WAY better than the first! The dog was amazing tho! I would have liked this book a lot better if it hadn’t been for Emma. I just didn’t like her a lot, even though there were parts of her personality that I liked. Be ready to be taken on a roadtrip! To go on a trip is something, to go on a trip alone is another thing, but to go on a trip alone in a stolen car with the company of a stray dog is completely a different thing, not to mention scary, specially when you’re just 16-turning-17. But to Emma Healy, it’s something that she needed right now, something that might take her to find the missing piece in her life. Peter Finnegan on the other hand, just wanted to get away from home (a Yeah, another J. Smith! Peter Finnegan on the other hand, just wanted to get away from home (a home that never felt like home to him), to cool down things between him and his father probably, and to visit some historical places. But when he got a call from Emma, his next door neighbor needing a ride, the trip somehow became purposeful and exciting. Emma, Peter, and the stray dog Emma found on the way, altogether they wander the path going to North Carolina in a convertible car Peter had stolen for his getaway trip, stopping only when they need a sleep or food. The story is more than just a trip to some historical battlefields. It’s a tale of someone who feels incomplete, different, and alone. She / he searches for that missing piece only to find out that that last piece of the puzzle is within her already. It only needs your courage and spontaneity to come out. Emma Healy - she felt so different from her intellectual family who very much enjoy the company of books and knowledge of science & math. I think I understand how she feels. It’s hard to feel that something isn’t right about you, that something is missing, that somehow you don’t belong in this world, that no one understands you. But there’s just something different about her situation. She has a twin that she never seen and never known, not until she discovered it herself one week before her 17th birthday. I am starting to believe that part of her situation, is because of that mysterious twin brother. They were together when they were born, shared a lot of common things even physical features and identical DNAs. So probably because she hasn’t seen or known her twin brother that it affected her life. Maybe her life will never be complete but it’s not the reason to feel unhappy and alone. Sometimes, I hate her moodiness and direct attitude and harsh tune, especially toward Peter who went all the way to her and gave her a ride, not to mention his company. Peter Finnegan – Like Emma, he felt that something is missing in his life too. Someone he never seen or knew except in a photograph and a few information from his father. It’s his mother, who died just after he was born. I pity Peter for the whole trip because, it seems like the people he cares for doesn’t feel the same way about him. His father never bothered sitting in the living room and have chitchat with him. Emma is absorbed with her own misery that she doesn’t seem to see Peter more than just a next door neighbor she happened to know. Then there’s Emma’s parents who Peter loves to talk to because of their welcoming attitude and their wide range of knowledge about the world. But when he learned that Emma has a twin brother, he somehow began thinking that maybe her parents treated him well because they can see in him the son taken so early from them. But I liked Peter. Actually beneath his glasses and alarmingly Civil war aficionado spirit, lies an amazing good-natured guy who appreciate simple things and who’s really good at places. He could be an excellent tour guide. Overall Thoughts: Jennifer E. Smith’s books are always a nice break from the tension and seriousness a lot of other books and series have. It’s always nice being able to pick up one of her books noncommittally, thinking “I’m going to feel something while reading this, and it’s going to be great, and then my life will go on a little bit better because of this good thing.” That was no different with this book. While I liked the characters a little less than some of the other books of hers, I still really enjoyed it. If you’re a fan of the writing style that purposely tries to mean something, and succeeds, this book, and her books in general, are definitely a thing for you. The Good: I always love the language of Smith’s books, and how the metaphors and sentences so easily make me feel something, and feel as if I completely know where these characters are coming from, and that I too am a part in their story. I also love the growth and change we actually see take course over these couple days in Emma and Peter’s lives, as they accept the people around them a bit more, and learn how to better be themselves, accepting that as well. The Plot: While I guess there wasn’t much in the way of this, I did still enjoy it. From the road trip(always have had a thing for those, especially after Paper Towns), to seeing how all the little pieces came into play, the plot was still there enough to keep me enraptured in the emotional story that was taking place at the same time. I don't know what to say other than that this was really really boring. I didn’t expect much out of this because, well, it’s written by Jennifer E. Smith. The Comeback Season was a DNF for me and I only sort of liked The Statistical Probability of Love at First Sight. Even if I never read any books written by her, I’d still be hesitant to start because it doesn’t seem like a book I’d like. The main reason I wanted to read this was because Emma and Peter go on a road trip. I’ve never actually been I don't know what to say other than that this was really really boring. I didn’t expect much out of this because, well, it’s written by Jennifer E. Smith. The Comeback Season was a DNF for me and I only sort of liked The Statistical Probability of Love at First Sight. Even if I never read any books written by her, I’d still be hesitant to start because it doesn’t seem like a book I’d like. The main reason I wanted to read this was because Emma and Peter go on a road trip. I’ve never actually been on a road trip before, so reading about one is more exciting than it normally would be. I was so close to just giving up on this book. I feel like nothing happened. At all. When I finally finished reading, I spent a good minute just staring down at it and thinking, “What?” The ending was nice, I guess, but incomplete. Then again, that’s how the whole book felt. A small part of me was hoping You Are Here would improve at least a little bit. Even if it was on the very last page. Guess what? That part of me died. This book was a pretty fast read and I enjoyed it, a lot. I’ll try not to say anything about her name. But if my parents had called me Michael Johnson or something equally forgettable you better believe I’d be using a pen name. Would you rather read a book by John Jones or Jolt Beckencragg? I can’t think of a name more overused than Jennifer Smith. I really tried. I don’t understand. This was published in 2009. Was that before Simon & Schuster knew about present participles tendency to weaken writing and make it sound amateur and passive? While lying on the couch, watching the numbers... she sat now, regarding...trying to figure out....trying to fix...sputtering....she’d said, traipsing down...he said, thumping the hood....he’d said, looking off toward...he said, giving the tire a little kick...parades were making their way...displaying fading Greek letters. I’m not even gonna try to catalogue all the passive uses of was. Where was her editor?! I’m not trying to be pretentious or snotty. I just really can’t stand reading books my subconscious is constantly trying to edit. Way too many cringes in 3 pages. And the attempts at humor seemed like 1st draft stuff. Also: ornery? Is this author over 60? Apologies to Ms. Smith. It’s really not her fault that the writing is so bad. Her publisher is to blame. They spend enough on editors that drivel like this should’ve been stamped out in the first round of copy edits. This is by no means my favorite of Jennifer's books, however, it did have me getting teary-eyed and smiling at the ending. Jennifer is a master of weaving geography and travelling into her books. You Are Here is no exception. I loved Peter's obsession with maps and how he wanted so badly to just go SOMEWHERE. I get the travel bug so often that I can imagine reading about so many places just to feel like I've been there. My issues with this book were the ways Emma siblings just happened to live c This is by no means my favorite of Jennifer's books, however, it did have me getting teary-eyed and smiling at the ending. Jennifer is a master of weaving geography and travelling into her books. You Are Here is no exception. I loved Peter's obsession with maps and how he wanted so badly to just go SOMEWHERE. I get the travel bug so often that I can imagine reading about so many places just to feel like I've been there. My issues with this book were the ways Emma siblings just happened to live conveniently in a perfect path back to her childhood home. Also, I find it hard to believe that a family would completely erase a child they had lost. There would have to be pictures or something around the house. I also did not like the way Peter and Emma were somewhat thrown together at the end, after there being little to no romance between them the entire book. Definitely not my favorite bookish couple. Emma comes from a family of high achievers but has always felt lost. Peter has his alcoholic police sheriff whilst being a high achiever. Emma concocts a plan to travel to North Carolina arriving just about on her seventeenth birthday as she wants to find out about a brother she never knew, Thomas her twin. After a break down and a pick up, Emma and Peter become travel buddies along with their companion of a stray three legged dog. As the two travel to Gettysburg, have a run in with the police, mak Emma comes from a family of high achievers but has always felt lost. After a break down and a pick up, Emma and Peter become travel buddies along with their companion of a stray three legged dog. As the two travel to Gettysburg, have a run in with the police, make it to the cemetery where she feels closer than ever to her whole self and find her family waiting for her after realizing what she uncovered and maybe things can finally get better between the family at last. "Some of the most interesting people I know are a little bit nuts." Having read The Statistical Probability of Love at First Sight I expected a fun, quick read but instead I was surprised to get an engaging story that touched upon some important issues. Sure, it had some romance elements and the two main characters had their ups and downs, but I related to certain aspects on a personal level, so I connected to the story really quickly and enjoyed it. The side characters were as well written as "Some of the most interesting people I know are a little bit nuts." Jennifer E. Smith is the author of eight books for young adults, including WINDFALL and THE STATISTICAL PROBABILITY OF LOVE AT FIRST SIGHT. She earned her master's degree in creative writing from the University of St. Andrews in Scotland, and her writing has been translated into 33 languages.